PH4 SMD iç mekan full renk LED modülü yüksek çözünürlüklü HD ekranlar en kaliteli görüntüyü sağlar.Görsel bir şölen için en ideal üründür.Kalabalık bir yerde kullanın ve insanların en iyi kaliteyi,resim ve videoyu kusursuz bir şekilde tatmasını sağlayın. Yüksek kaliteli görüntü için yüksek kaliteli modül . 4mm olan yüksekliği mükemmel bir görüntü ortaya çıkarır ve oldukça hafiftir . Oldukça narin tasarımı ve hafifliği yerini değiştirmek ve indirmek için kolaylık verir . Farklı yerlerde kullanılabilir . PH4 SMD iç mekan Led ekranları en son teknoloji ile üretilmiş olup tarama özelliği olan ve yüksek parlaklıkla birlikte en yüksek çözünürlüğü vermektedir.1000Hz ile tazelemek ve çözünürlüğü destekler bu da en kalteli resimleri,videoları ve yazıları vermektedir. A high quality module for high quality display output. The 4mm pixel pitch provides great quality output and makes it lightweight. The delicate design and lightweight makes it ideal to move and install. Can be used at different places. The material, modules and chips are selected with great care. We purchase the material from reputed vendors. Chips are purchased from big brands like Cree (USA), Nichia (Japan), Epistar, Opto (Taiwan). ICs are bought from MBI, TMS, PWM and MingYang. These manufactures are known for their great quality products. The control system of PH4 SMD Indoor Full Color LED Display Module features a sending card, receiving card and receiving hub. Easy to operate manual power supply voltage selection switch can be used to adjust supply voltage 110V and 220V. 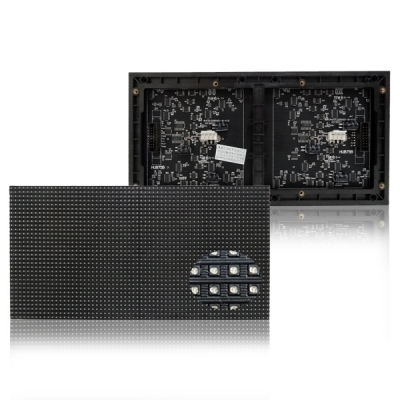 We provide most cost effective LED display module on the ex-factory price. The PH4 SMD Indoor Full Color LED Display Module is manufactured as per latest technology-dynamic scanning mode which offers higher brightness and high refresh rate. It features a high refresh rate of 1000Hz, producing best quality outputs in form of pictures, videos and texts. The Indoor LED display supports different input devices and multiple signal input. Can be connected to PC, DV, DVD players etc. Also accepts multiple signal inputs such as AVI, MPG, MPEF, TXT and much more. The PH4 SMD Indoor Full Color LED Display Module features high resolution HD screen which offers best quality output. An ideal gadget for ideal visual feast. Install at a crowded place and let everyone enjoy the best quality images and videos with utmost clarity. Focus in every single detail of product. Keep improving the quality.